My vacuum cleaner will not pick up. Why? First, check the belt to make sure it is not worn or broken and that the agitator moves freely. Also, check the bag to see if it is full. Besides these two possibilities, check the air stream for possible clogging. If you have recently installed new carpet it may shed fiber and lead to a clogged air stream or require the bag to be replaced more frequently. Objects may also become lodged obstructing the airflow. Over a period of time, the brush roll may become worn. My carpet seems to be getting fuzzy. Is my vacuum cleaner causing this? No, fuzzing is the hairy effect on the carpet surface caused by wild fibers, slack yarn twist, or by fibers slipping out when walked on. There is a natural tendency for the fiber ends to separate a bit and loosen excess yarn. How many stokes with my vacuum cleaner is necessary? 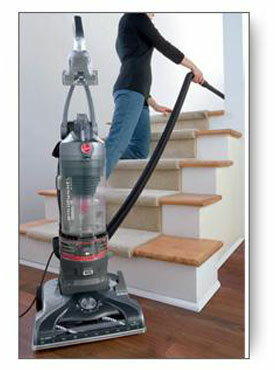 Heavy traffic areas should be vacuumed daily, with seven strokes for thorough cleaning. Areas receiving little traffic can be vacuumed once a week or every three or four days, with three or four strokes for adequate maintenance. If you have additional questions please call or visit our store. Bring in your vacuum cleaner for a FREE estimate.